Today my oldest daughter started kindergarten. She woke up at 6 a.m., bright-eyed and bushy-tailed. We made pancakes, packed her Wonder Woman lunchbox and got her school supplies gathered up, then walked to school as a family. She was fine. More than fine, in fact–dropped her stuff in her cubby, ran straight up to new friends and started playing. I was fine until we were strolling down the sidewalk about two minutes away from the school. I feel that I admirably sucked back tears, thanks to some sweet-but-not-so-sweet-to-make-it-worse sympathy from my husband, who was walking beside me. She doesn’t go back until Thursday–they’re staggering the start of the kindergarten classes, which I think is brilliant. So I still may lose it on Thursday. But I’m thrilled for her, because school is such an adventure! Learning is AWESOME! 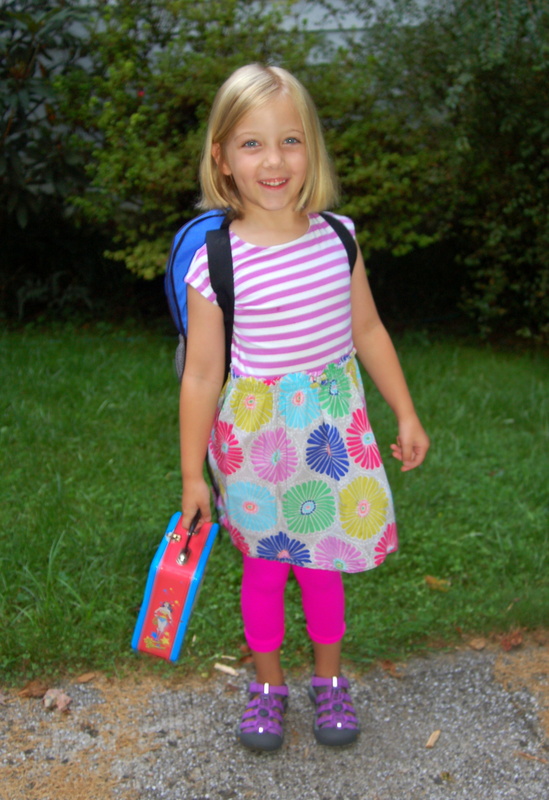 This entry was posted in Uncategorized and tagged back to school, first day of kindergarten, firsts, Katherine Scott Crawford, kindergarten, kindergarten blues, mama, motherhood, parenting, school. Bookmark the permalink. But you’ll always be her mom, no matter what! Absolutely, Ellen! Thanks for the reminder–it makes me feel better.